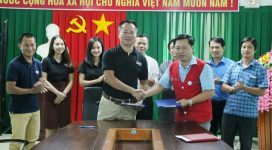 An inception workshop that was held today at the office of Vinh Linh District People’s Committee marked the official expansion of Project RENEW / Norwegian People’s Aid’s (NPA) mine action operations into the district that is located on the northern side of the former Demilitarized Zone (DMZ). The goal of the expansion is to make Vinh Linh safe from cluster bombs and other explosive debris left over from the war that ended forty years ago. 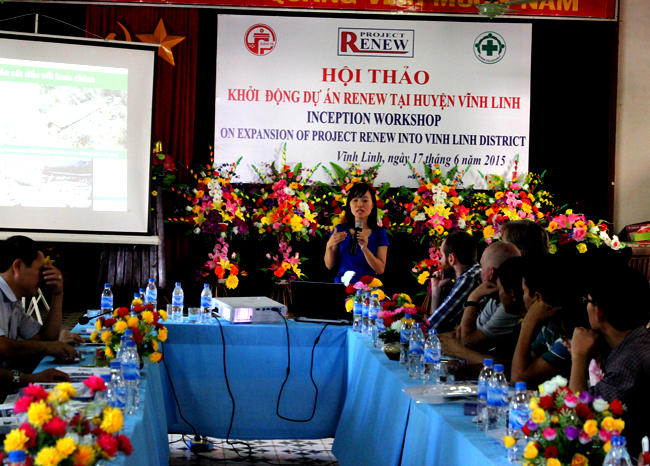 RENEW/NPA Operations Manager Nguyen Thi Dieu Linh presenting operational methods to be implemented in the district of Vinh Linh. The workshop was attended by 70 people who represented Quang Tri Department of Foreign Affairs, Provincial Military Command, Vinh Linh District People’s Committee, Bureaus of Labor, Invalids and Social Affairs, Farmers’ Union, Women’s Union, Red Cross Association, People with Disabilities Association, Education, Youth Union and Natural Resources and Environment. 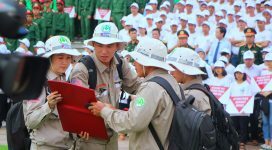 Other participants were representatives from People’s Committee of 22 communes in Vinh Linh District, Project RENEW’s management staff and team leaders, international staff of NPA Vietnam and Mine Advisory Group (MAG). Located on the northern side of the former DMZ, Vinh Linh District was one of the most heavily bombed areas during wartime. According to the US bombing data, between 1964 and 1973, the US Air Force flew 17,299 sorties, dropping general-purpose bombs, cluster bombs, incendiary bombs and others on the land of Vinh Linh. Statistics from the Provincial Mine Action Database Unit (DBU) show that since 1975 Vinh Linh has recorded 1,029 accidents caused by Unexploded Ordnance (UXO), resulting in 365 deaths and 692 injuries. In 2014, three UXO accidents were reported with one fatality and two injuries, mainly related to fishing with explosive. Following the approval of the provincial government, with support from NPA, Project RENEW will deploy an Explosive Ordnance Disposal (EOD) to provide quick response to UXO sightings to be reported by local population to RENEW’s non-technical surveyors and hotline telephone number. Moreover, four Cluster Munitions Remnants Survey (CMRS) teams will be put on the field for mapping confirmed hazardous areas (CHA) that need full clearance. CHAs that are generated during this CMRS process will be migrated to the DBU and passed on to MAG for conducting clearance. Samples of cluster munitions on display at the workshop. 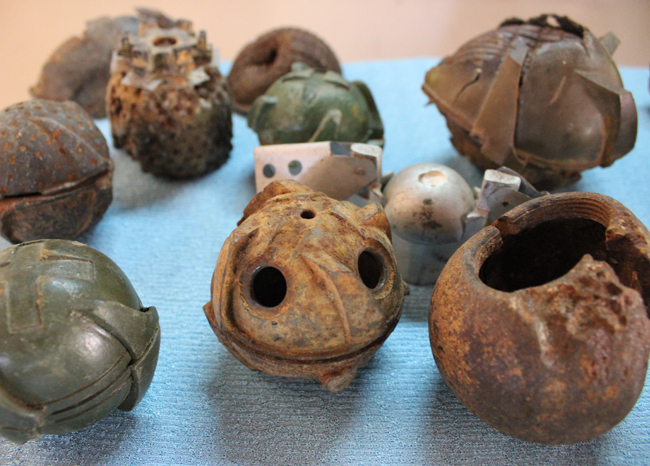 Since 1975, cluster munitions and 40mm grenades have accounted for nearly 50% of UXO accidents in Quang Tri Province. Mr. Resad Junuzagic, incoming NPA Vietnam Country Director, expressed his impression on the strong support of the provincial government to the project expansion in Vinh Linh. 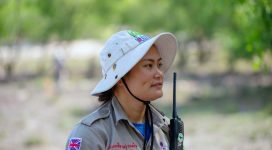 “We are here as friends to help people of Vinh Linh address the problem of cluster munitions and other explosive debris of the war,” said Junuzagic.